The Orlando Magic have not had a good basketball team in several years, but with a growing supply of young talent, things are looking up in southern Florida. 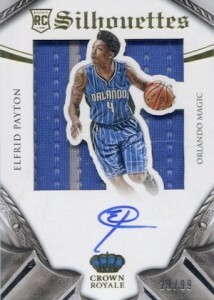 Elfrid Payton is one of those young players that has fans and collectors excited for the future and Payton's play has his rookie cards on the move. 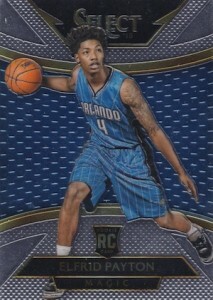 Shop for Elfrid Payton rookie cards on eBay. 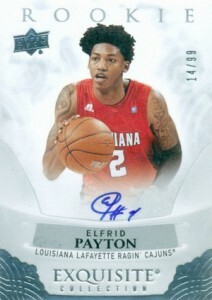 Despite playing college basketball at an atypical school for NBA picks, Elfrid Payton still earned a first-round selection in the 2014 NBA Draft based on his strong defense and well-rounded game at the University of Louisiana-Lafayette. 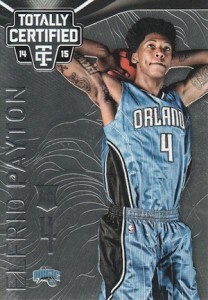 After a slow start with the Orlando Magic, Payton's play picked up, earning him the Rookie of the Month Award in January. Two consecutive triple-doubles in March helped push his name near the top of the 2014-15 rookie class and he was later named to the 2014-15 All-Rookie First Team. 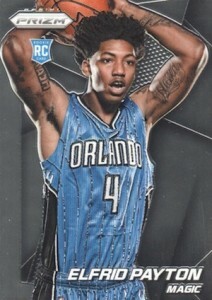 Panini offers the most popular rookie cards for Elfrid Payton. 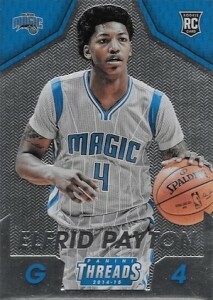 In addition to the base rookies, several 2014-15 brands, including Court Kings and Gold Standard, feature multiple cards for Payton in the main set. 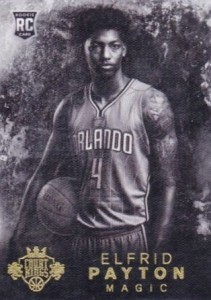 Gold Standard is also notable because it is the first official rookie that is autographed and is also on-card, which should help values in the long run. 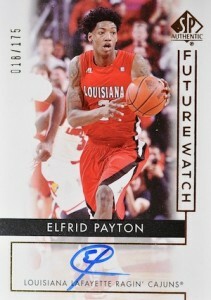 Elfrid Payton also has cards available in 2013-14 Intrigue and Signatures that were originally issued as redemptions. 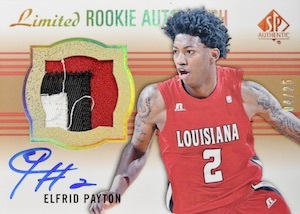 While Panini owns the sole license for NBA cards, collectors have more options with Upper Deck products, but with a college theme. The earliest card is found in 2013-14 Exquisite Collection. 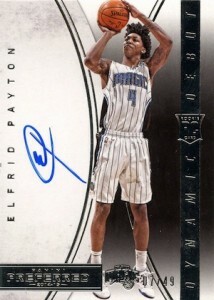 An on-card autograph and print run of 99 makes it one of the top overall options for collectors. 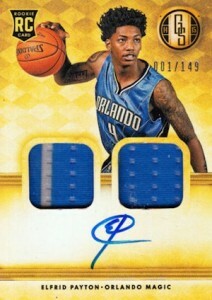 2014-15 SPx offers an appealing budget option with an autographed jersey card featuring a mid-level print run. 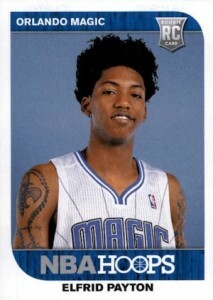 View a complete look at all the Elfrid Payton rookie cards below. The guide will be updated as new cards are released. 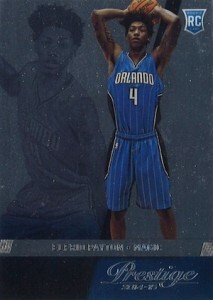 Also, notable pre-rookie and college cards can be seen below the rookie cards. 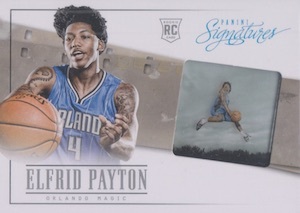 Artistic and full of color, 2014-15 Court Kings offers collectors something different for their Elfrid Payton rookie cards. 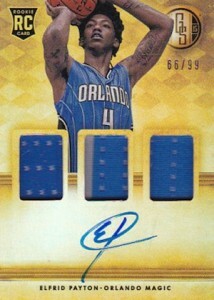 With five versions in the base set, the cards become increasingly rare. The first four cards are shown below and the final card, numbered to ten, is the only one missing. 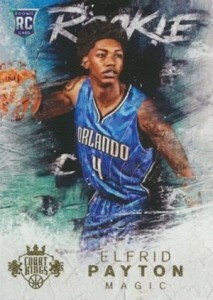 Simple with a nostalgic brand design, Donruss is a worthy rival to Hoops on the low-end side of basketball collecting. 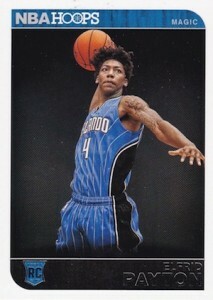 The Elfrid Payton rookie in Donruss is one of the only options for the young guard to include an in-game action shot. Although the base print run of 199 might seem more limited than previous Gold Standard releases, the total amount is a bit higher when you combine the other two cards that are also part of the base checklist. 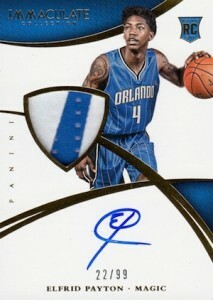 On-card autographs and jersey pieces should make these rookie cards for Payton some of the best overall values. 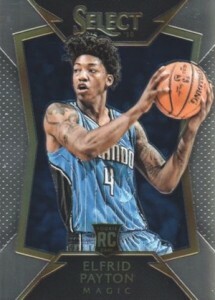 As the first Elfrid Payton rookie card to be released, Hoops is more about having something to collect versus a truly desirable rookie. 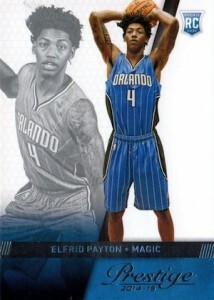 However, the product is ideal for set collectors and budget collectors and these Elfrid Payton cards can be found for very little. 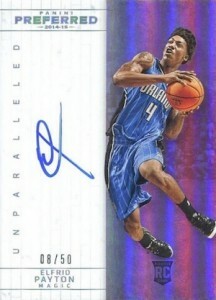 On the high-end side of the market, Immaculate Collection has quickly become a preferred stop for rookie collectors. 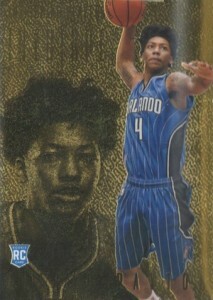 The premium design of the Elfrid Payton rookie card is further enhanced with an on-card autograph and low print run. 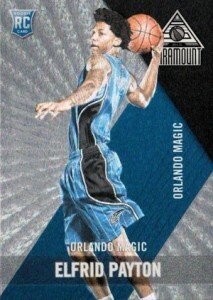 One of several Panini rookie cards with a silver theme, Paramount utilizes Dufex and a few splashes of color. In addition to the base card, there is also a short print for Payton. 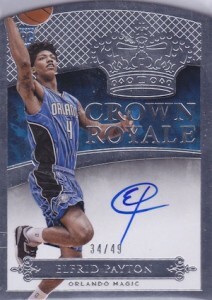 Elfrid Payton is heavily featured in 2014-15 Preferred along with many of the other rookies. 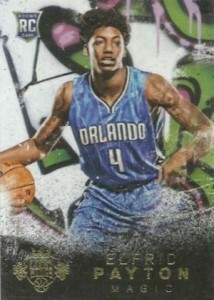 There are five different cards in the main set and all feature a different design and on-card signature. 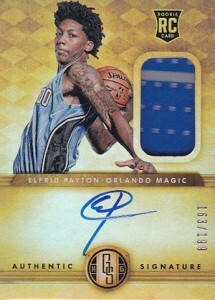 All the cards for Payton are numbered to 99 or less, with four cards at #/50 or less. 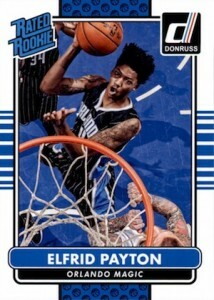 The flagship foil product for Panini basketball, Prizm and its multitude of parallels presents collectors with quite a few Elfrid Payton rookie card choices. 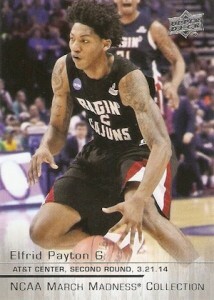 The zoomed image of Payton dominates the card, but also makes him the clear focus. Prestige is non-traditional due to its Target-only release and the three-tiered setup. 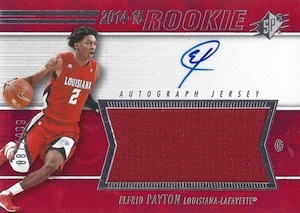 The main Elfrid Payton rookie version, shown on the left, is the most basic. 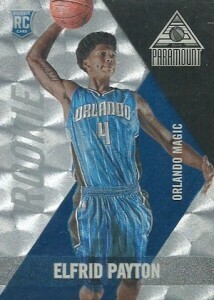 There is also a Plus version that adds foil and the Premium card has a Refractor-like effect and thicker card stock. 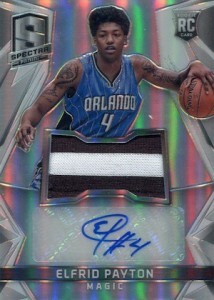 One of the more popular basketball products of the year, Select is like a beefed-up version of Prizm. 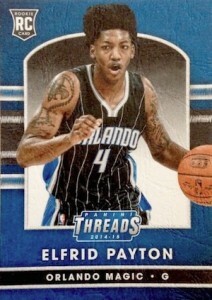 Gold and black in the design offers a more distinct look for the Elfrid Payton card in the Concourse set while the Courtside card for Payton features a bright blue background. 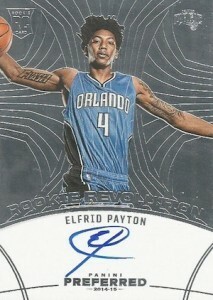 A loud design makes the rookie card for Elfrid Payton in Spectra stand out amongst the rest. Although the sticker autograph not ideal, the card is a very affordable rookie card to still feature an autograph and jersey piece. Because it is a sticker, it may not appeal to everyone, but the Panini Stickers set is a great option for new collectors or children. 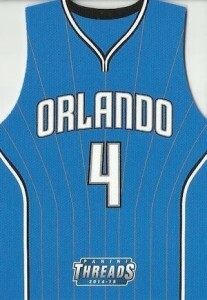 The budget Elfrid Payton utilizes a simple Hoops design. 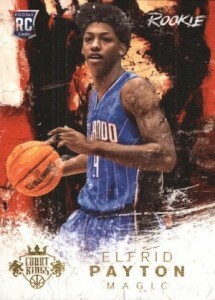 Another product with several rookie card options, Panini Threads is also exclusive to Target. However, instead of multiple versions of the same card, collectors are treated to four distinctly different cards. All four options can be seen below. If you still need more foil in your life, Totally Certified is another place to look and the design also incorporates embossing. 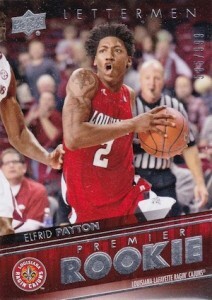 Like most of the other Elfrid Payton rookie cards, Totally Certified features a pre-dunk image. 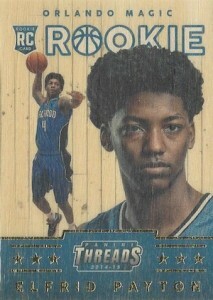 14-15 National Treasures Elfrid Payton Rookie Patch Autograph Card #34 99!